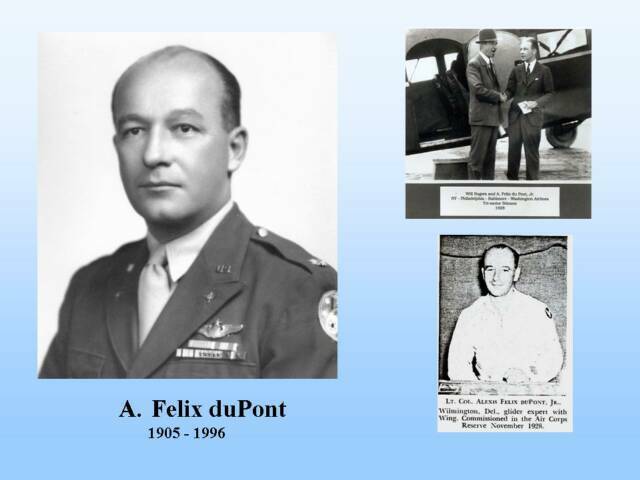 Alexis Felix duPont, Jr. (1905-1996), financier and philanthropist, was an active pilot until age 88. He taught his immediate family and many others how to fly. He helped his brother Richard C. duPont, Sr. establish All American Aviation (became Allegheny Airlines, now US Airways); he was a founding investor and director in Piasecki Helicopter. The mission statement of the Aircraft Owners and Pilots Association was drafted in Felix duPont's Wilmington office in 1950: "To promote safety in every manner in all phases of aviation, and to engage in research and investigation upon, and the dissemination of, the science and scientific aspects of aviation and kindred subjects." Mr. duPont learned to fly in the Air Corps at Brooks and Kelly fields in 1927-28. He held air transport and instructor ratings. In the 1940s he served as vice president and director of All American Aviation, Bellanca Aircraft and American Export Airlines. In World War II, he served in the Pentagon in the Air Transport Command, and later as an Army Air Corps combat training officer and director of glider operations in New Guinea and the Philippines. He retired in 1965 from the Air Force Reserve as a lieutenant colonel. Besides aviation, a major interest of Mr. duPont was St. Andrews School in Middletown, founded by his father. The younger duPont served 40 years on the board, including the chairmanship.